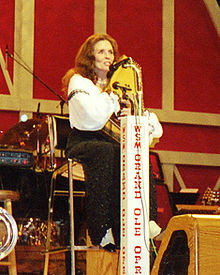 Valerie June Carter Cash (June 23, 1929 - May 15, 2003) was an American singer, actress, and dancer. She was the second wife of singer Johnny Cash. She and Johnny had many hit records in their careers. She died due to complications of surgery. Her widower, Johnny, died four months after her. She was the cousin of President of the United States Jimmy Carter. June Carter Cash was born Valerie June Carter in Maces Spring, Virginia, to Maybelle Carter and Ezra Carter. She was born into country music and performed with the Carter Family from the age of ten, beginning in 1939. June and her sisters, with mother Maybelle and aunt Sara joining in from time to time, reclaimed the name The Carter Family for their act during the 1960s and 1970s. Carter was married three times and had one child with each husband. All three of her children would go on to have successful careers in country music. Her last marriage was to Johnny Cash. In 1968, Cash proposed to Carter during a live performance at the London Ice House in London, Ontario, Canada. They married on March 1 in Franklin, Kentucky, and remained married until her death in May 2003, just four months before Cash died. The couple's son, John Carter Cash, is a musician, songwriter and producer. June Carter Cash died in Nashville, Tennessee, on May 15, 2003, of complications following heart-valve replacement surgery, in the company of her family and her husband of 35 years, Johnny Cash. ↑ June Carter Cash in the 1930 US Census. ↑ 3.0 3.1 Downey, Ryan J. Country Star June Smith First Wife Carl Smith 73. MTV.com. 2003-05-15. Keep on the Sunnyside: June Carter Cash Remembered, Wet paint . June Carter Cash (forum), Pro boards 80 . Friends of the Carter Family Fold . This page was last changed on 3 October 2013, at 21:27.